Aliens in the Attic is a family feature film about a group of kids who save the world from an alien invasion. All the while, their parents do not know what is going on in the attic. For a family film, Aliens in the Attic has its appeal. It works for a young audience, as it does not get too serious, too violent, or too complex. Instead, it is a pretty simple film with silly situations and action to keep things interesting. Of course, if you are not looking for a family film, it is not for you. At the same time, Aliens in the Attic is not one of the best movies of the year, but it offers a manageable level of entertainment (even if you are not a kid). The movie features the Pearson family who is getting ready for a weekend of family fun. Unfortunately, most of the kids are teenagers and not looking forward to it. 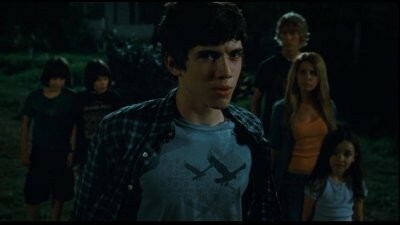 Recently, the main hero Tom (Carter Jenkins) has been having trouble at school. His grades have dropped. His parents Stuart (Kevin Nealon) and Nina (Gillian Vigman) are not too happy about it. The other members of the family include Hannah (Ashley Boettcher), a young seven year old, and Bethany (Ashley Tisdale), the boy crazy big sister. At the vacation home, the rest of the family joins them: Nana (Doris Roberts), the grandmother, Nathan (Andy Richter), Stuart's wilder brother, and his kids Jake (Austin Butler), Tom's cooler cousin, and twin boys Art (Henri Young) and Lee (Regan Young). Bethany's boyfriend Ricky (Robert Hoffman) also joins the family. He is a bad guy and pretends to be in high school to get "close" with Bethany. Everyone loves him (except Tom who sees through his facade). Meanwhile, a small team of aliens crash the party. 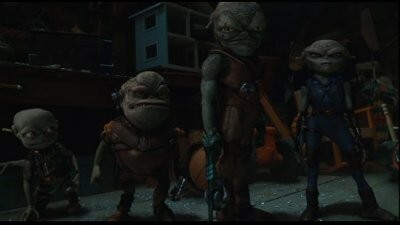 They are Skip (voice J. K. Simmons), the gruff leader, Razor (voice Kari Wahlgren), the tough female alien, Tazer (voice Thomas Haden Church), the all muscles alien who likes weapons, and Sparks (voice Josh Peck), the nerdy alien brought to manage the team's gadgets who is not fond of violence. As the aliens set up camp in the attic, Tom and Ricky go to the roof to fix the satellite, which was destroyed when the aliens arrived. Tom learns about Ricky's true intentions. He is a college student and is only interested in having fun with his sister. At the same time, they cross paths with the aliens. Ricky is taken over by a mind control device, which fails on Tom. Apparently, the aliens did not take into account a child's physiology and it only works on adults. Tom enlists the aid of Jake, Art, Lee, and Hannah to stop the aliens from taking over the planet. They call the police and try to get help, but the local sheriff Doug Armstrong (Tim Meadows) thinks it is a prank. The kids soon learn that they cannot rely on anyone for help. They keep their parents in the dark (and Bethany who is too preoccupied to figure out what is going on with the mind-controlled Ricky) and take the fight to the aliens. They create make-shift weapons like a potato gun and Hannah befriends Sparks who helps them fight his violent brethren. Overall, Aliens in the Attic is a decent family feature. It is not a bad movie or terribly uninteresting. Yet, it probably won't win any awards. For families and young audiences, it works. There are several attempts at humor, which generally are based on characters you aren't supposed to like in silly situations. For instance, Ricky is taken over by the mind control device. Eventually, Tom gets a hold of the controller and uses Ricky to fight the aliens. He also embarrasses Ricky in front of Bethany and the rest of the family. The action sequences are well suited for the young audience. For example, there is a scene where Nana (mind controlled by the kids) and Ricky (controlled by the aliens) fight it out. Nana does some wild Matrix-like kung fu moves, which is silly, but something the young audience will enjoy. In the end, Aliens in the Attic has its appeal. It is a good enough movie for a family feature, but definitely not a must-see. The video in this release is given in an anamorphic 1.78:1 ratio widescreen color format. The picture quality is quite good. It suffers from a slight grain, but detail remains to be sharp and clear. However, there are moments when the picture suffers noticeable compression artifacts. Overall, the picture is relatively clean and should look good on big screen televisions. The audio is presented in English 5.1 Dolby digital surround and dubbed Spanish and French Dolby surround. The 5.1 track is dynamic and makes decent use of the surround sound capability. In general, the sound quality is good and it provides an audible and clean track for dialogue and it sounds very lively when necessary (sound effects, music, etc.). The DVD also contains subtitles in English and Spanish. Introduction to Film with Ashley Tisdale (0:17): Ashley gives a very short welcome and introduction to the film. Apparently, she had a lot of fun making the movie. Introduction to Special Features with Ashley Tisdale (0:15): Ashley returns with an overview of special features. Alternate Ending (2:43): is exactly what the title says, an alternate ending. It ends the movie with a slightly different tone. Gag Reel (5:04): is a montage of goofs and slipups caught on tape during filming. Deleted Scenes (3:30): not included in the movie. There are three, which are entitled "The Basement", "Anti-Gravity Sheriff", and "Alternate Resolution". Behind the Zirkonians (15:18): is a still animation (imagine a comic book) with voiceovers about the lives of Skip, Tazer, Razor, and Sparks before they went to Earth. Meet the Zirkonians: is an interactive featurette that allows you to select one of the aliens and learn more about them. You can click on various parts of their body and short interviews, text dialogue, and snippets from the movie are shown in a little screen to the side. The Ashley Encounters (4:00): is an behind the scenes interview with Ashley Tisdale. She and other cast members star in it. They talk about different aspects of the movie, each other, characters, plotlines, and so on. Kung Fu Grandma (1:15): is a joke trailer for Doris Roberts' fight scene. Aliens in the Attic is a decent family feature. The story is not very complex, but it can also be fun. It has light comedy and action that a young audience can enjoy. If you are looking for a family oriented film, then Aliens in the Attic should be able to delivery an enjoyable feature for the entire family. At the same time, it is not a great movie and best as a rental.